As you are driving towards Kalahari Game Lodge, with the sun setting in your rear view mirror, and the dust still in the air after a long day of game watching and exploring the area - you will realise this is a very special and unique place, that will offer you its full potential if you are willing to open yourself to it. The Kalahari Game Lodge arises over the last dunes towards the eastern border of Namibia, adjacent to the Kgalagadi Transfrontier Park; it lights up the early evening sky with the Boma fire already inviting the guests to its warmth. 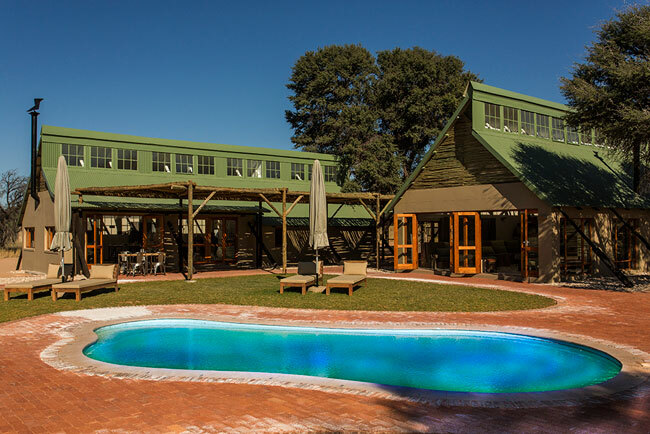 Arriving at the The Kalahari Game Lodge you can choose between camping or staying in one of eight beautiful chalets. For the more adventurous and Overland travellers - Kalahari Game Lodge has four campsites available, each equipped with electric power outlets, water on tap and sufficient shade. The central ablution facility is clean and neat, and you can enjoy a lovely hot shower after a warm Kalahari summers day. Each campsite can accommodate up to four people and arrangements can be made for larger groups travelling together. The development of more campsites is still in progress and will soon be complementing the existing camping area. These campsites will be more private and set further apart from each other.